With the epileptic state of power supply in Nigeria today, even owning a device with a large battery capacity is not enough to keep your phone running for a full day especially if you happen to be a heavy user. And that is one of the main reasons why demand for power banks has always been on the increase. 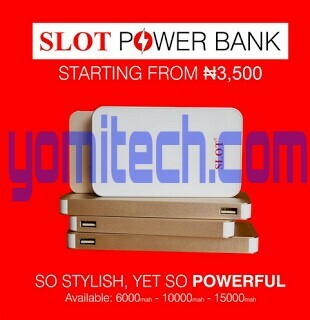 Slot has just recently Launched it's own branded power banks. And I guess this might probably end the two major problems a lot of people face when purchasing power banks, which are durability and price. The new power banks from slot ranges from as low as N3,000 to N6,500. And since slot happens to be a trusted store in Nigeria I guess we can at least put our trust in them to provide us with quality power banks. You can get the slot power banks from any slot store nearest to you and you can also order HERE.